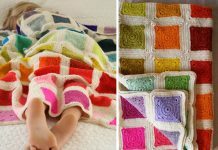 This Crochet Velvet Dotted Lines Blanket Free Pattern is so beautiful and comfortable. Especially the white dotted lines are so sweet and lovely. Bernat Velvet is a super soft, bulky, and chenille yarn, so you’d better try a tighter stitch and a tighter tension.The finished size is 31 inch x 41 inch. 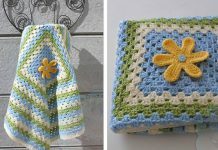 The blanket is so soft and squishy, and it will be a perfect gift to your family and friends, or as a baby shower gift because of the beautiful color combination and the softy. 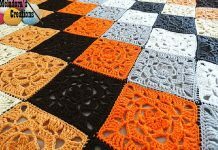 Thanks Daisy Farm Crafts for sharing these free crochet patterns. The links for the free patterns are provided below photos. Happy crocheting.